Everyone loves cakes right? Hands up…I do! The one thing that’s better than just any old plain cake is a cake that has been personalised – I have never had a personalised cake but I did get one done through Tesco’s years ago for my mum’s birthday which she loved. 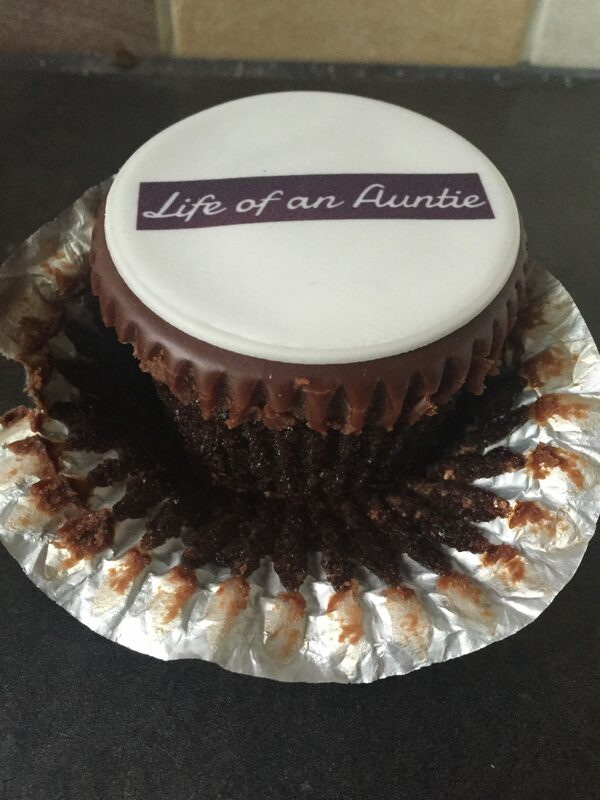 Caketoppers are the home of personalised cakes and produces, everything from full size celebration cakes to individual personalised cupcakes. 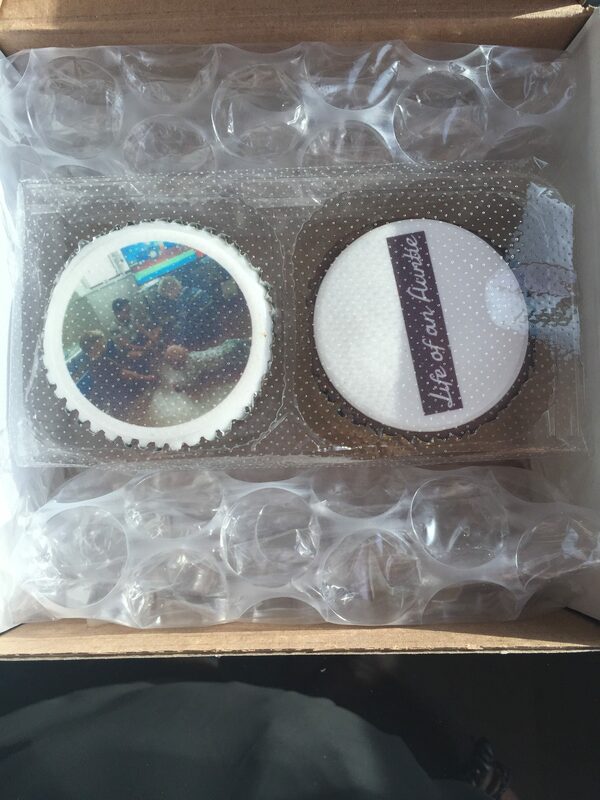 We were sent a set of 2 cupcakes to taste and they were super yummy..
You can personalise your own Cupcakes with pretty much anything – from photos or wording. I decided to put my blog name on an a picture of my nephews on mine. The cupcakes came well packaged and sent through via Royal Mail. Unfortunately we missed the delivery and they were thrown over the back garden gate and surprisingly the cakes were still in perfect condition despite the delivery method. You have a choice of cakes which come in classic sponge with white icing in a silver foil case and chocolate sponge with chocolate icing in a gold foil case. We received one of each flavour so we could enjoy both varieties. I love that you have a choice to suit any preference. 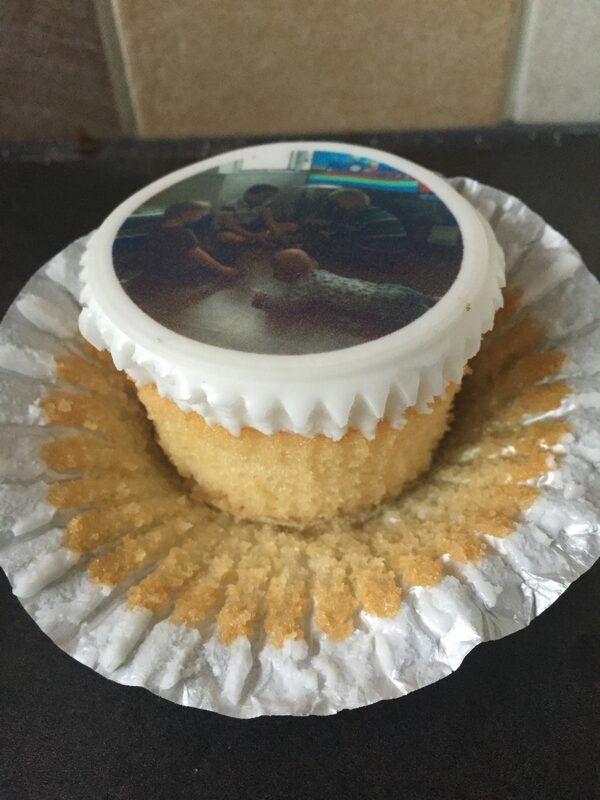 The cakes had thick icing on top, the cases were full to the brim with fluffy sponge cake that tasted fantastic and the photo on the top was printed onto icing. The sponge was soft, light and fluffy and the whole cake was delicious, a really lovely cake. Even after not eating the cakes straight away after receiving them they were still as fresh as if you had brought them the same day. I will defianitely be buying cakes from Caketoppers again and it was great service despite the delivery service from Royal mail. They would make a great gift also, but who needs an excuse to buy cakes? Not me! Caketoppers create really lovely cakes and if you would like to use their service you can get 10% off your next order using my special code LOAA10 at the checkout. Disclosure: I was sent these products free of charge for the purpose of this review, However all thoughts and opinions are my own. Hello there my little cherubs, Hope you are all well and had a good week? Apologise this is a little late too but been a crazy week at my new job. Last Saturday me, my fiance Tom, my mum and dad all headed over to Cirencester to watch one of my cousins get married. 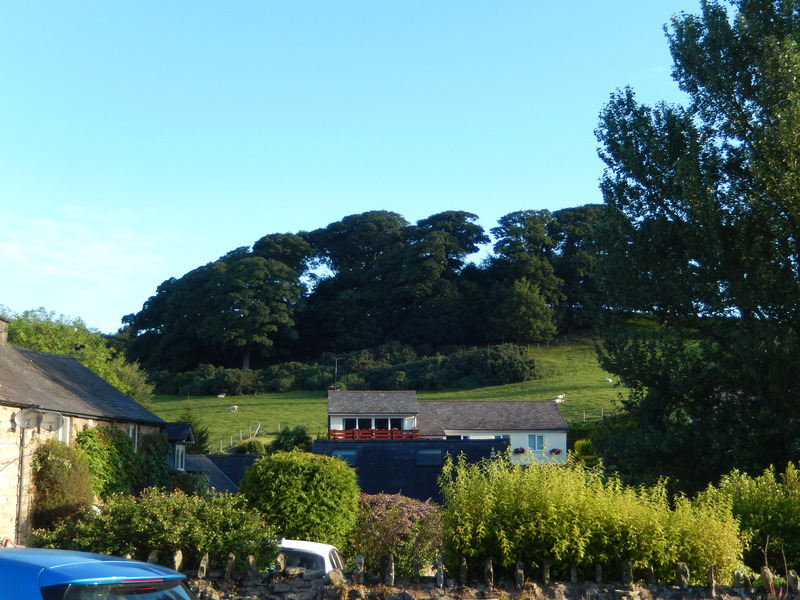 It was a beautiful service at the church then went back over to my aunt and uncles house for the after party where they did afternoon tea and a ‘cook your own’ BBQ on the evening. 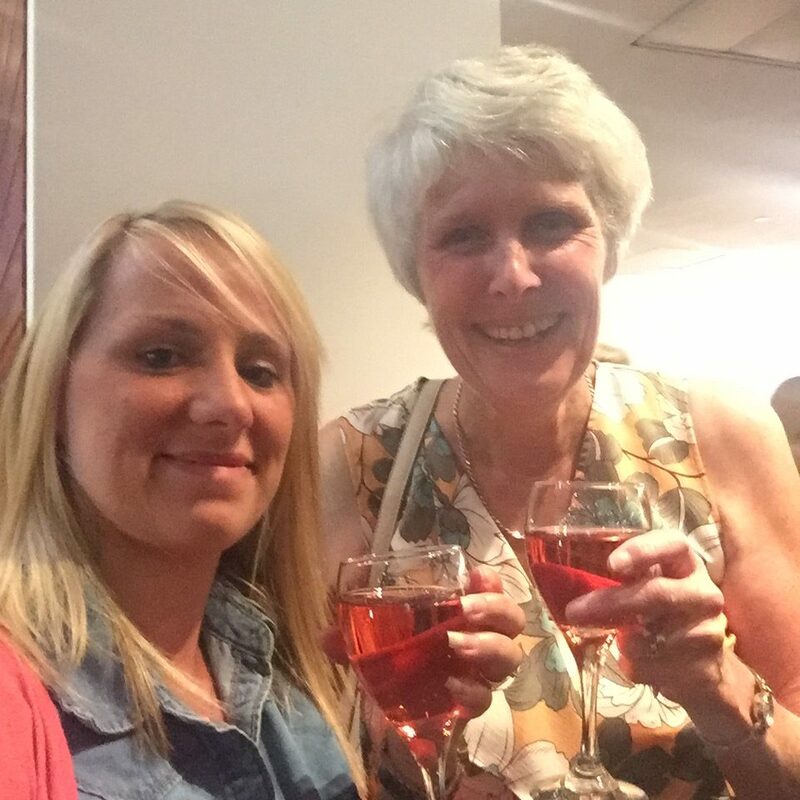 Despite the rain it was a great day and night had by all and was lovely to catch up with all our family again. Nothing new or different this week, except smarter clothes for my new job I started on Monday at Cushman & Wakefield. My new job work contract and paperwork which I was required to sign and send back. A thunderstorm, came from no where as one minute it was hot and sunny the next it was dark, raining and thundering and last pretty much the rest of the afternoon into the evening. Well I tried something new this week, Chicken Tikka Burgers, they were delicious too. I saw them while I was food shopping and thought they would be something different for a change. I added in bacon, cheese and fried onions. I have started my new job this Monday at Cushman & Wakefield as an AP Clerk (Accounts Payable). I love it, the people are lovely the firm is lovely. I have always been a money conscious person worrying about every penny I have and even more so when we brought our first house 2 years ago because of the big responsibilities of paying the mortgage, bills etc and making sure we got the best deals we could on everything we bought. I always knew I wanted to buy my own house so saved for years as a young girl to have the money for a deposit, and even before we were anywhere near buying a property I was buying stuff for the house, Cleaning products, plates, saucepans, cooking utensils, coffee, tea (things that wouldn’t go out of date) etc just to spread the cost over a longer period of time. Some people called me mad for doing this but in the long run it saved us so much time and a larger expense all in one go. Anyways here below are my top money saving tips that I believe work for me. 1) I tend to go food shopping on an evening as firstly it’s easier as I’m at work all day and secondly you get lots of reduced products and bargains, all fresh but the best before date is close so they reduce the product for quick sale, they reduce them quite a lot too so worth it. Then I just put it all in the freezer to use at a later date. 2) I’m always searching, downloading and using coupons from the internet. You can find 50p, £1.00, £1.50 or more off it’s just knowing where to look then you just print them and take them shopping with and save yourself some money off. 3) Branded products, I used to always say “you can’t beat Heinz ketchup” I now don’t believe you can always tell the different in shop brands to named brand products. Same as things like tea, I absolutely love tea but I’ve brought Aldi’s own brand tea and drank PG tips, Tetley, Yorkshire tea, and decaf tea and I honestly personally can’t taste the difference except the price difference. Others may disagree. 4) Do your research first I am always comparing prices online between supermarkets to see where the best price is, Asda, Sainsburys, Morrison’s & Tesco but I will only go if it is not to far out and worth it. I do feel, in my opinion Sainsbury’s and Tesco are a little expensive and over price their items. 5) Store point cards, get them I know it’s a pain having lots of cards in your purse but it is so worth it, Morrison’s “more” card offer points every time you spend and when you reach 5000 point you get a £5 off voucher to use on your shopping plus lots of other vouchers. It doesn’t take long to collect the points up. 6) Instead of always buying bin bags, I know there not that expensive, So I use the free charity bags that come through the door, some weeks we get none, others we get 3/4 bags and because there is only 2 of us and we recycle everything we can, we don’t get through many, usually one a week maybe more. 7) Stamps, most of us will use these in everyday life, over the years I have seen and watched the prices creep up and up for a single stamp. I don’t mind, but I do think now 64p for a 1st class stamp and 55p for 2nd class is getting a little on the expensive side. My tip to you is this, when you received a letter in the post check if it has been franked, scribbled on or defaced etc…?! if not great news carefully peel it off and reuse it. Easy right?… NO, you need to be very careful not to tear or leave any previous paper on it and make sure it is stuck down properly, I can’t remember the last time I brought a stamp or a book of stamps for that matter. Everyone may have their own saving ideas that work best for them, but these are mine. * Remember, also don’t leave your change behind – every penny counts! Would love to hear your money saving tips! I LOVE the latest trend for the baby milestone cards – such an easy and special way to capture all those ‘firsts’ moments that we just adore as parents/aunties/grandparents and uncles. I can’t wait to use these when I have a family and capture every funny, embarrassing and ordinary moment. Tommee Tippee have got in on the action of the milestone baby cards, and produced their own lovely set of 20 double-sided cards that capture all those special new baby moments including the ones that you sometimes might not want to remember. These cards were initially made for the Baby Show in February this year, but they went down extremely well with customers/parents so they’ve managed to get some more produced to help celebrate the Asda Baby Event which starts TODAY! They are giving away a pack (whilst stocks last) with every manual breast pump and newborn starter set sold so go and get yours now! If you’re all already sorted for bottles and or pumps, don’t worry – you can still get your hands on your very own set as they’ve given me five sets to give away. If you’re a UK resident, enter the giveaway below via rafflecopter. #ParentOn campaign. I was sent a set of Tommee Tippee Mini Moments cards in order to run this giveaway. Giveaway open to UK residents only. The closing date is Monday 29th August at midnight. There is one prize of a pack of baby milestone cards for 5 winners. No cash alternative. I have always for many years suffered with hay fever, and I hate it, the constant sneezing, coughing, sore red puffy itchy eyes and runny nose and not even being able to go and sit in my own back garden makes me depressed and very fed up. 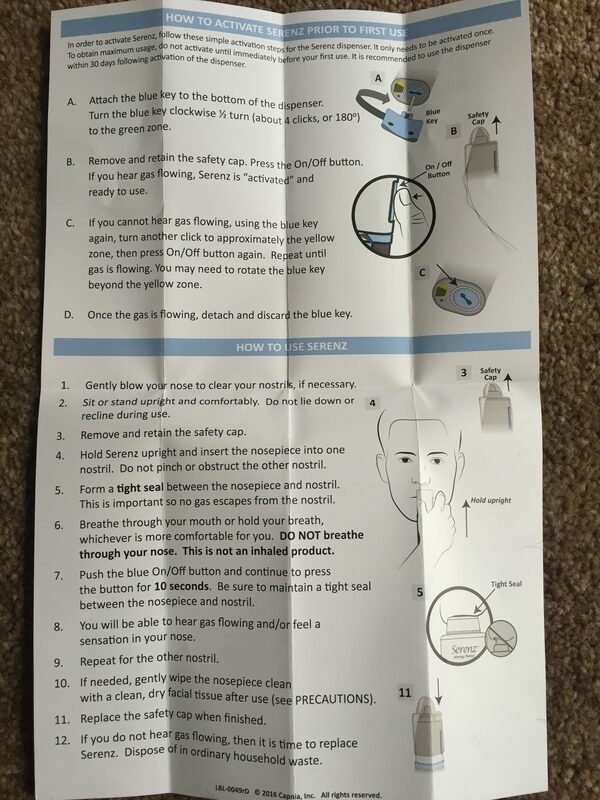 I have tried so many different products to try and relieve the signs and symptoms of hay fever before it has a chance to take hold of me, but nothing seems to work for a long period of day, normally just a few hours. 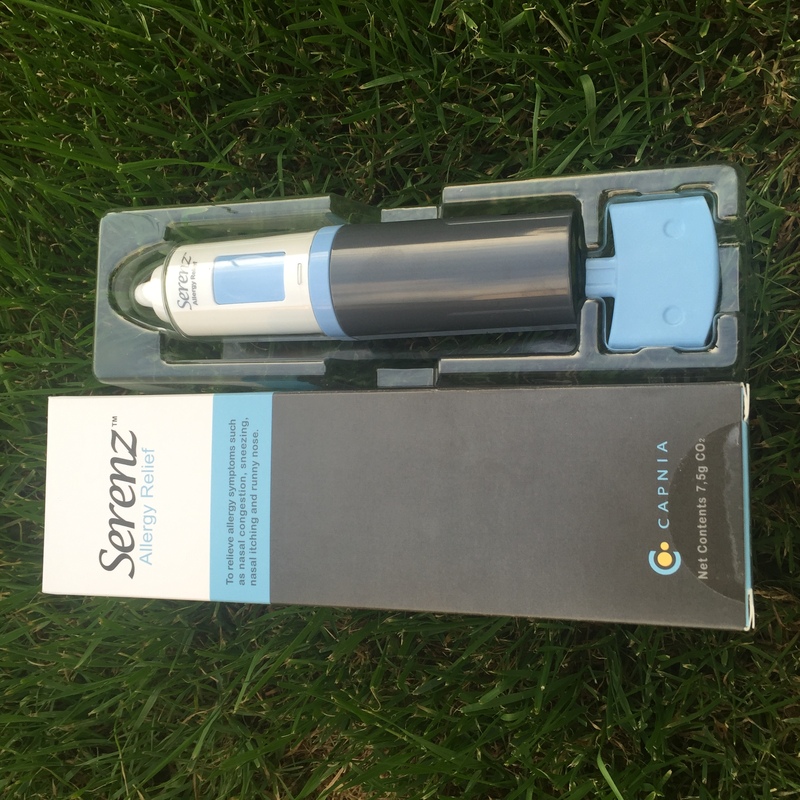 When I was offered to try a new product from Serenz I couldn’t wait to see if it helped me fight off the signs and symptoms of hay fever. It comes in a little box with instructions on how to use it and a key. It’s not small but it can be carried around in your handbag so when and as you need it can be used quickly and easily wherever you are. I would recommend anyone to try this who suffers with any of the these symptoms and I would defiantly buy this product again. My nephew loves helping out with everything, whether it be DIY in the house, passing tools, doing gardening or building furnitures you will always find him saying “Can I have a go please”, “Can I help do that please”. So when my dad had to sort the patio out at their house to relay them due to them sinking and needing rebedding down my nephew immediately started saying his favourite words. 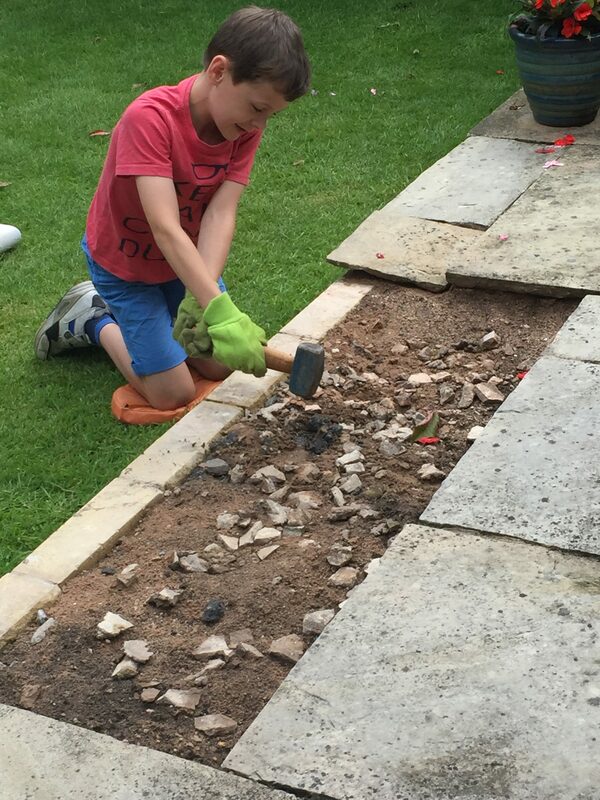 Here is my nephew Jack preparing the space ready for the slab to be relayed down, he was banging the stones flat and adding some sand aswell to give it support underneath. Good job little man! Well what a week it has been again, great weather until today and it started bucketing down with rain. Not what I want for the weekend when one of my cousins is getting married Saturday, let just hope it stops for a little while atleast so all the guest don’t look like drowned rats going into the church. 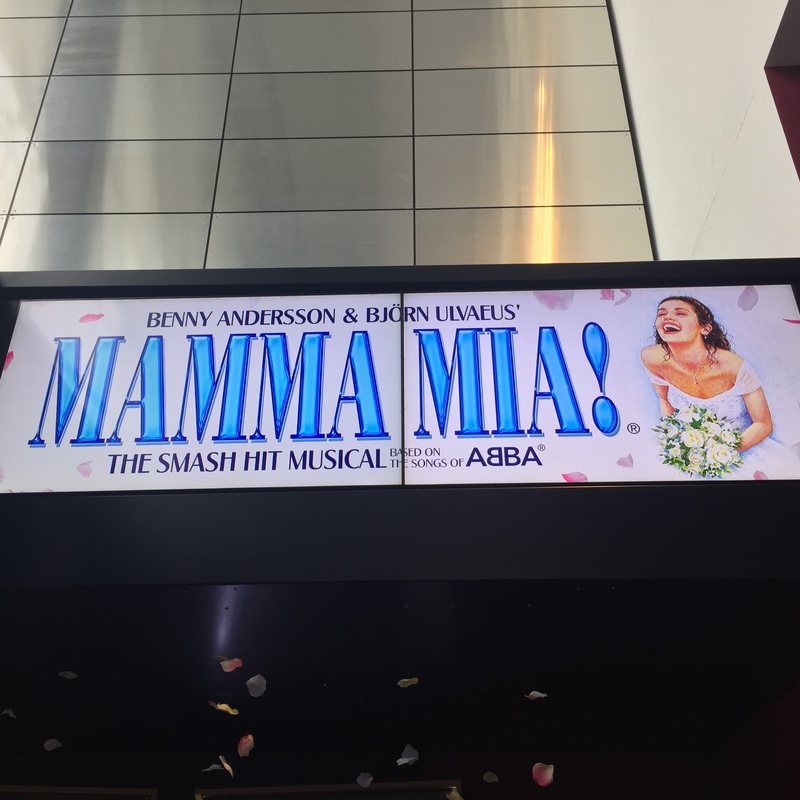 MAMMA MIA, I brought my mum tickets to go and see mamma mia at the hippodrome in Birmingham for her birthday present as a BIG surprise as she has always wanted to see it and always loved the film, so what a perfect opportunity. We went on the evening of 13th August at 7.30pm and it was out of this world, it was absolutely fantastic, we laughed and sang our hearts out the whole way through the performance, the actors & performers were amazing too and really made it come to life. Lots of summery clothes like dresses as it has been very warm in Birmingham this week, I hope it is here to stay for a while longer. Quite a few emails for getting involved in blog posts/articles, now to find time to sit and write them all up. I do love busy times like this when I’ve got lots of work to do. The fantastic new that my cousin gave birth to the safe arrival of her 4th baby, a girl named Ella-Joy, she already has 3 boys and they have always wanted a girl, and now their family is complete. Also that some selfish idiot wasn’t paying attention while driving and went in the back of my other cousin’s husband car while sat stationary waiting at a set of traffic lights, which with the force of that then pushed him in the back of someone elses car causing the devastating news that their car is a write off due to the cost and amount of damage sustained. 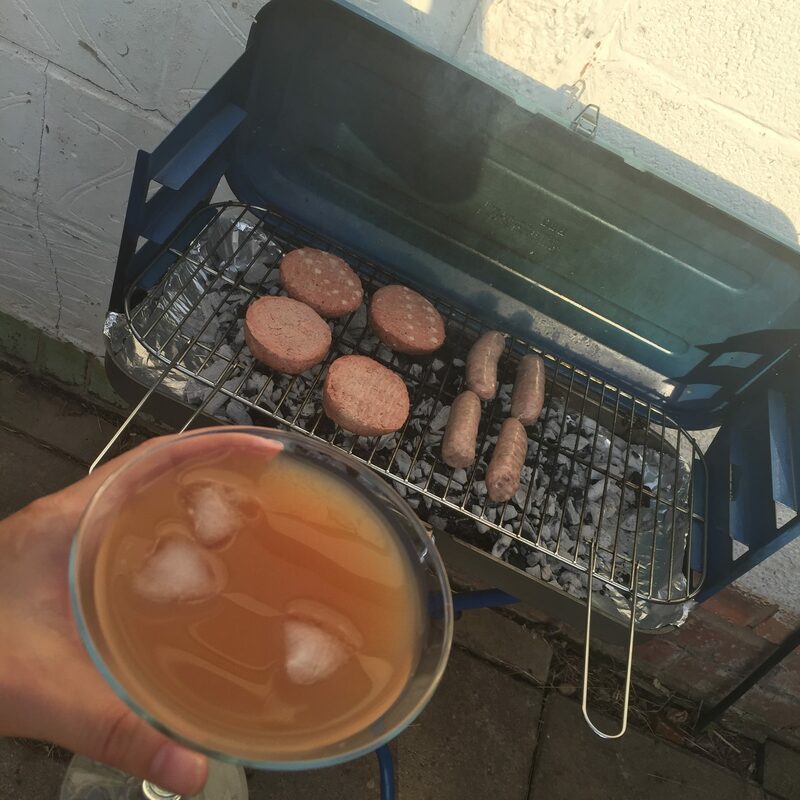 Wouldn’t say it’s a made as such but this week me and my fiance decided to do a BBQ after work as the weather has been gorgeous. We cooked, burgers, hot dogs and chicken, It was so good and the smell of a cooking barbecue is one of my all time favourites. We may have cooked the dog some meat aswell for her tea. I start my new job on Monday at Cushman & Wakefield as an AP Clerk (Accounts Payable). I’m so excited, cannot wait! Well we have just come back from a fantastic weekend in North Wales, Tom’s parents were there on their holidays so we decided to go down for the weekend and take the dog too. We had gorgeous weather and didn’t want to come back. How’s that for a view in the morning?! Our dog Carly run around on the beach like a lunatic, It was the first time we have seen and taken her to the beach and it was great to see her enjoying herself. 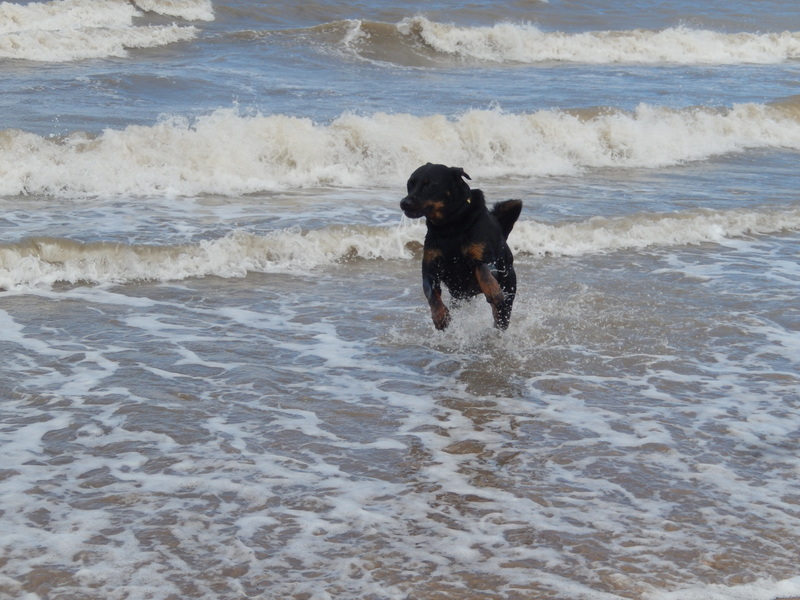 We couldn’t get her out the sea, she loved jumping over the waves. Shorts, Dress and trousers, the weather recently has been mixed but Wales was super hot and I lived in shorts all weekend. Sadly haven’t read anything this week. I was hoping to read whilst in Wales but there was no time for that. I will hopefully find time soon to have a good read of my kindle. That I had got an interview in Birmingham on Wednesday, fingers crossed something comes of it. Well not only that now, I was on the train back home and I got a phone call to say that they wanted to offer me the job not even an hour had passed after the interview and I had been offered a new job and accepted, I was over the moon and couldn’t stop smiling. Food shopping list after being away, It is so hard to try to cook different varieties of food dishes every week. It is my worse nightmare trying to cook. Have you got any tips? Would love to hear some of your meal ideas. There’s nothing unfortunately to report, It has been a pretty boring quiet week…Except I only went and got myself a NEW JOB, Interview, offer and accept all in the space of about an hour in one day. 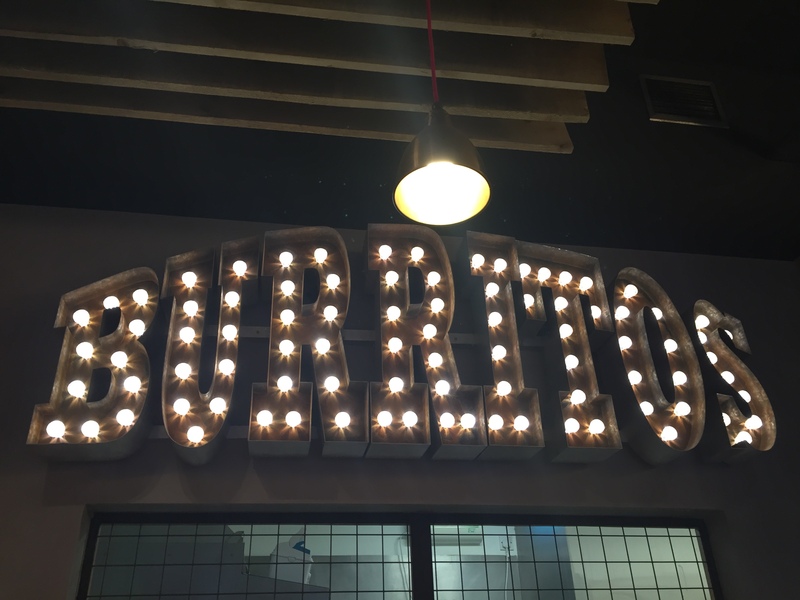 My fiance & me love mexican food, we’re always cooking and eating it at home, so when we were invited for food at mission burrito at Brindley Place we couldn’t wait. It’s not your average place as it is mix between a restaurant and a cafe, you don’t have a menu to look at, but there are boards above telling you what your options are. 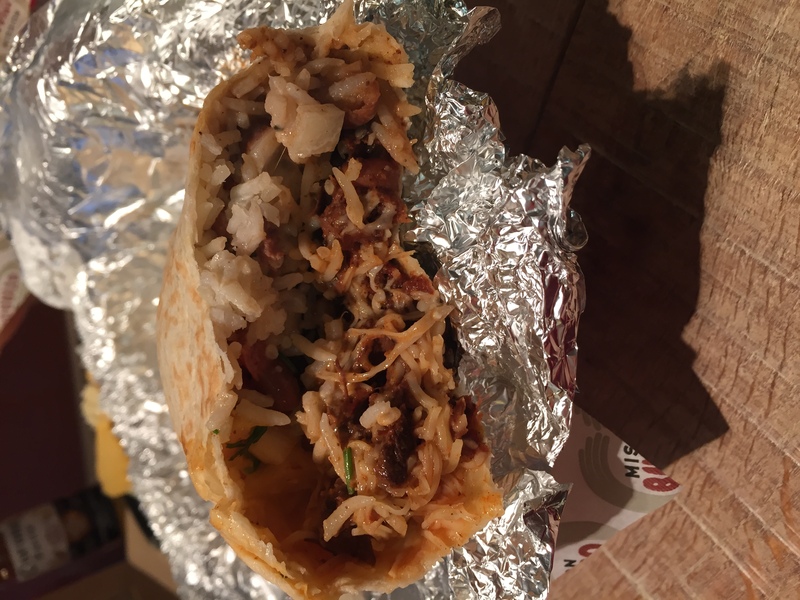 It’s all homemade food and you get to pick everything yourself to make up your own burritos. This was the selection of food you can choose from. There were 3 meats (chicken, beef and pork plus a veggie option), rice, salad, beans and then a selection of sauces, they were filled with everything and It is all homemade so they know exactly what’s in it. 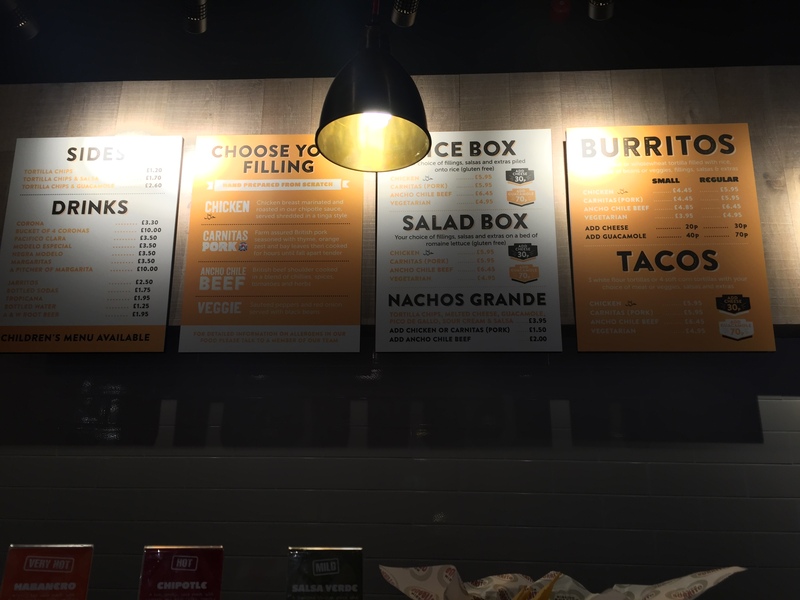 There were other options to choose from if you don’t like burritos. The pictures doesn’t show how big and full this burrito is but it was delicious. I struggled to hold it and keep it together and eventually it gave up and all fell apart. They are quite messy to eat but amazing. 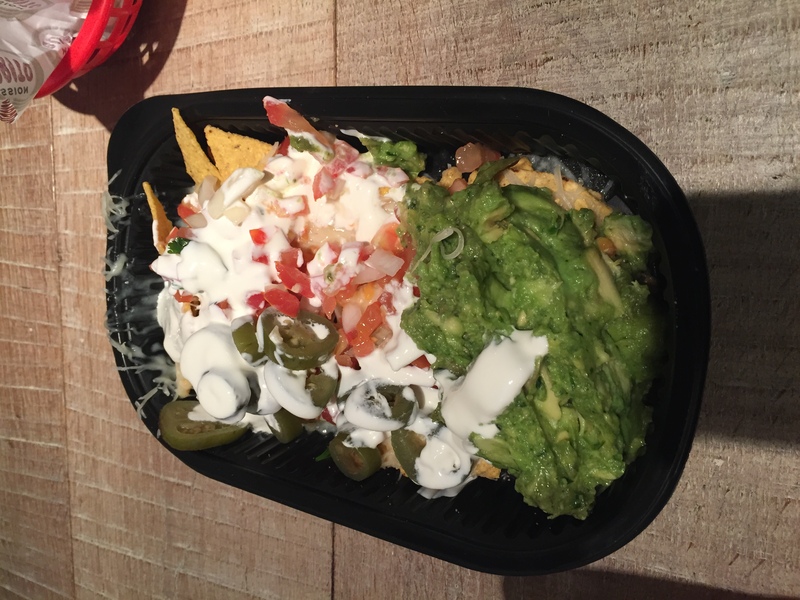 We were also given “Nachos Grande” which were delicious, I love nachos and these were loaded full of lots of amazing fillings. 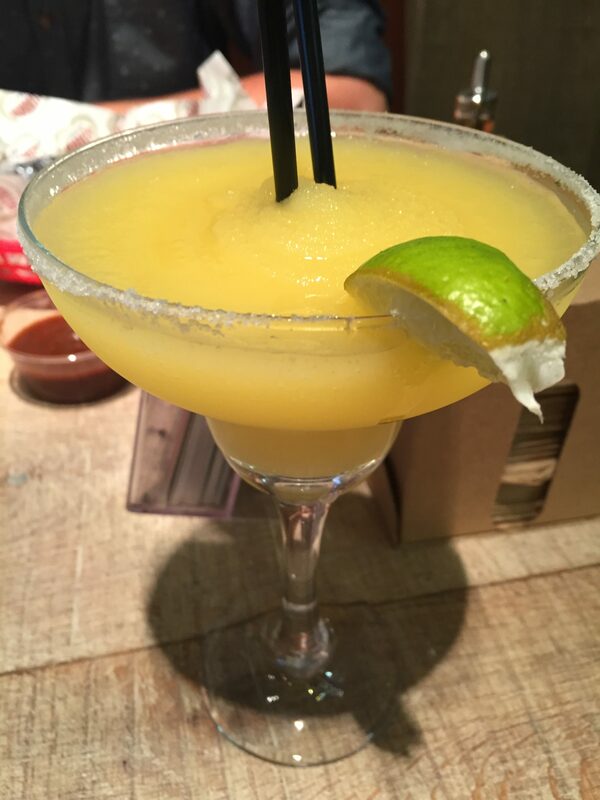 Along with food, I got given a Margarita Cocktails, which are also made on site, It’s not my normal sort of cocktail that I would go for, I’m more a Cosmopolitan type of girl but it was lovely. 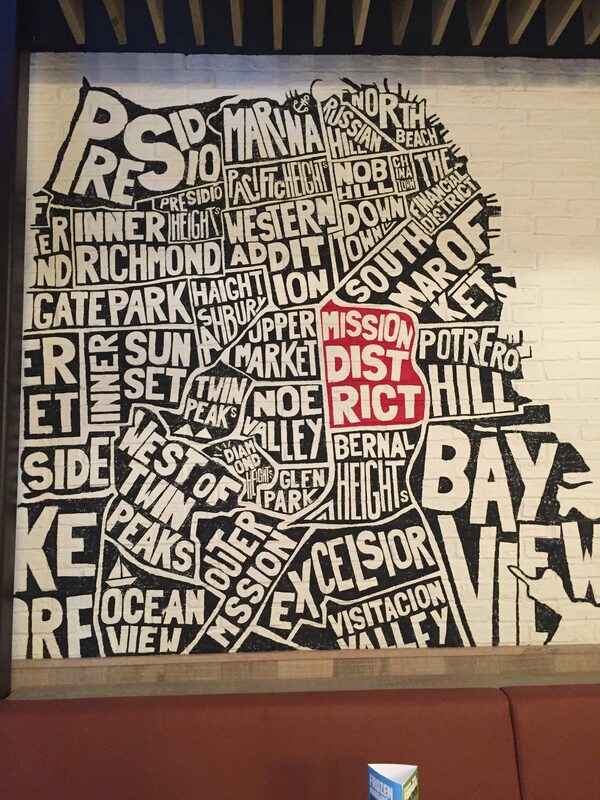 Where did “mission burrito” originate from? 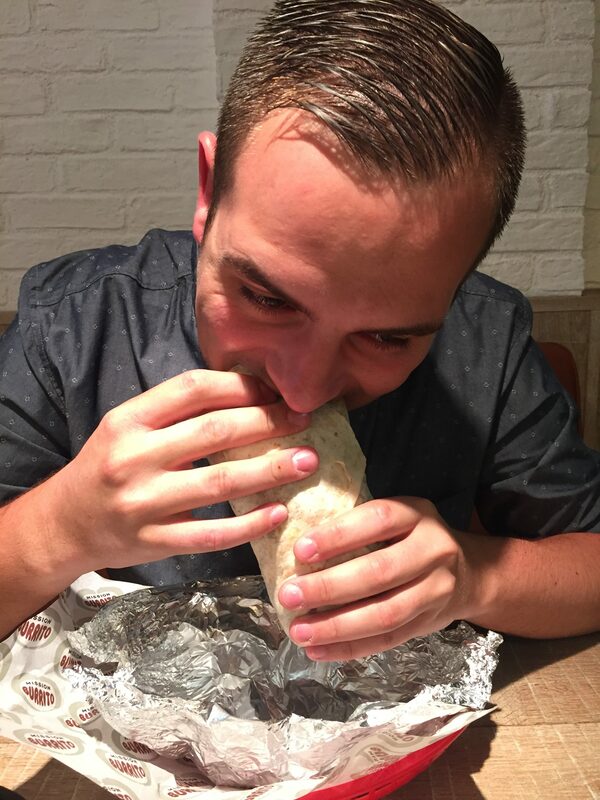 Our love affair with burritos started over a decade ago when we lived in San Francisco. 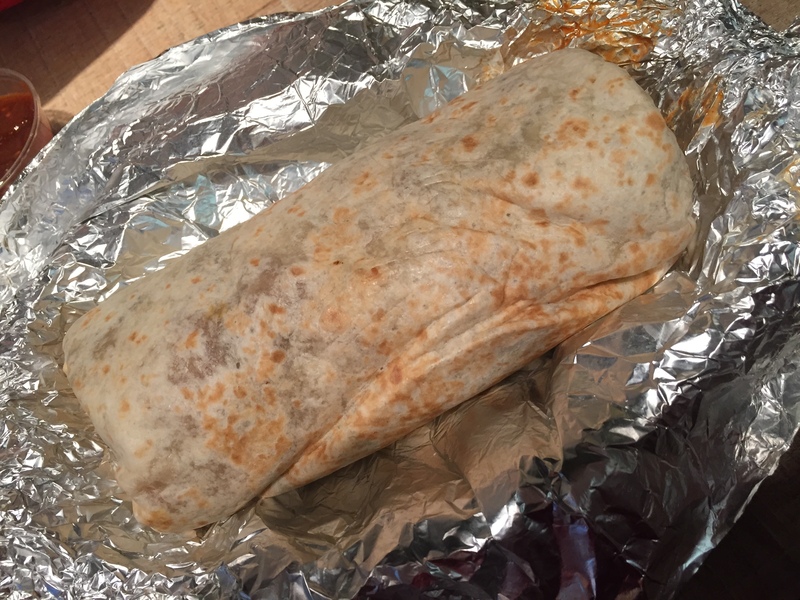 We developed a border line burrito obsession in the Mission Districts taquerias. 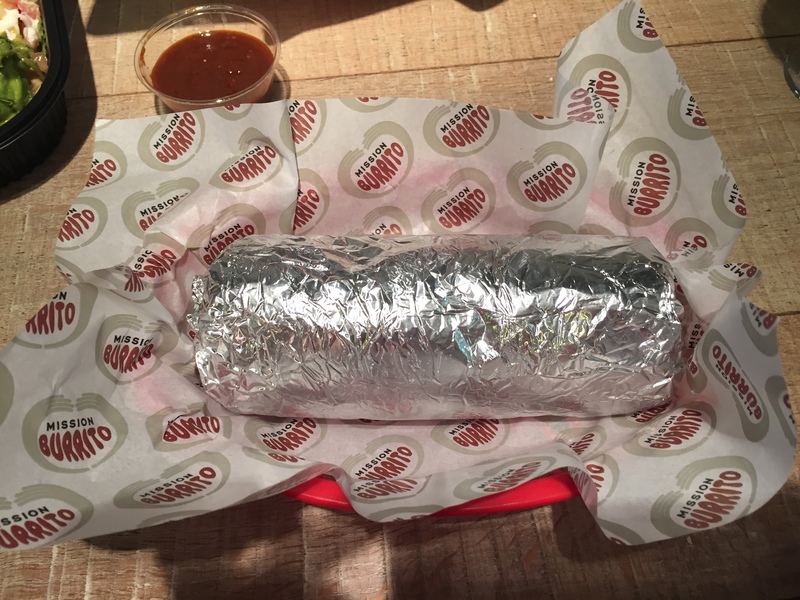 Unable to fuel our addiction back in the UK we quit our day jobs and set up Mission Burrito. You can read more about their background from here. The decorations on the wall were just stunning. 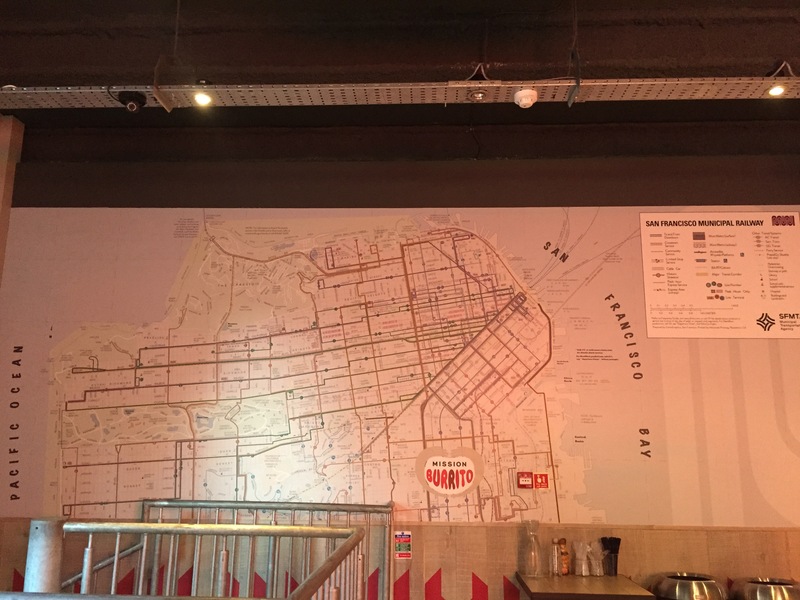 There’s a map of San Francisco upstairs and name places on the wall down stairs. The staff that were working and served us were friendly and really helpful, a massive thank you to Hayley & Moween for the great service provided. It was delicious food and I would go back again. * We were given one free meal & drinks free for the purpose of this review, all thoughts and opinions are my own.